Forrest Gump is one of those films that, if you don’t love it, you don’t have a soul. Winner of six Oscars, nominated for seven more, and currently sitting at #13 on IMDb’s list of the best movies ever released, it’s fair to say that this movie is something more than your standard drama, something beyond the normal critic’s fodder. To not adore Forrest Gump would be akin to not wanting to pet a Beagle puppy when it looks at you with its big, sad eyes. This is a special story, I think we can all agree, something that doesn’t come along very often and so should be cherished when it does. I’m not asking you to put it on your list of all-time favorites, but, come on, let’s just agree that it’s amazing. Forrest may not be a smart man, but he knows what love is. Born with a low I.Q. and told all his life that he just isn’t normal, Forrest Gump, a boy raised by a single mother in Greenbow, Alabama, will somehow become a pivotal figure in our country’s history, or at least a witness to a great many enormous changes. From a young age, Forrest was slow of mind but fast of feet, and he loved a local girl named Jenny, someone who needed to make her own, wild way far from the Southern home that damaged her. Forrest would travel far as well; attending college, playing football, joining the army, shipping off to Vietnam, meeting a half-dozen Presidents, and experiencing all that multiple decades had to offer. Along the way, he’d make friends that would last a lifetime; Bubba, Lieutenant Dan. But he would never forget his Jenny and the love they had always known. 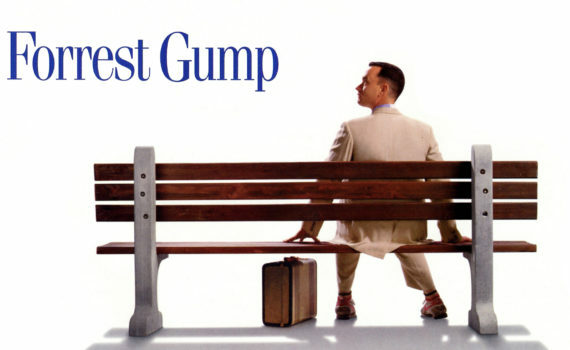 There’s a lot of good advice buried within the text of this film, none more poignant than, “Life is like a box of chocolates; you never know what you’re gonna get.” Forrest’s life takes us to so maybe historic events, from Nixon to Elvis, and we get to see so much Americana along the way. It really is a history lesson wrapped around a life lesson, and there’s no way you won’t learn something along the way. Hanks is phenomenal as Gump, playing the part with a grace that’s unprecedented. Wright as Jenny is fine, a great vehicle for Forrest’s love. Gary Sinise as Lt. Dan will blow you away, as will Mykelti Williamson as Bubba, Sally Field as Mrs. Gump, and basically anyone else who pops up in this film. The music is perfection, the era costumes & sets are great, and if you don’t well up just a little at some point during the story, you need to check your tear ducts.